Underneath the powdery white beaches, blue lagoons, and stunning islands is an otherworldly beauty. Scuba diving in El Nido is the best way to experience Palawan’s natural wonders hidden in the deep blue. If you want to take your tropical holiday to the next level, then scuba diving is the right adventure for you! It gives you exclusive access to El Nido’s amazing underwater world, from vertical walls and tunnels to deep dives and sandy flats. Whether you’re a seasoned diver or a beginner, El Nido has amazing dive sites to suit all experience levels. Choose your own dive adventure! Our local dive guides are well-trained and very experienced, with thousands of dives in El Nido. They know the ins and outs of the dive sites to give you the best diving experience as only those born and raised here can. 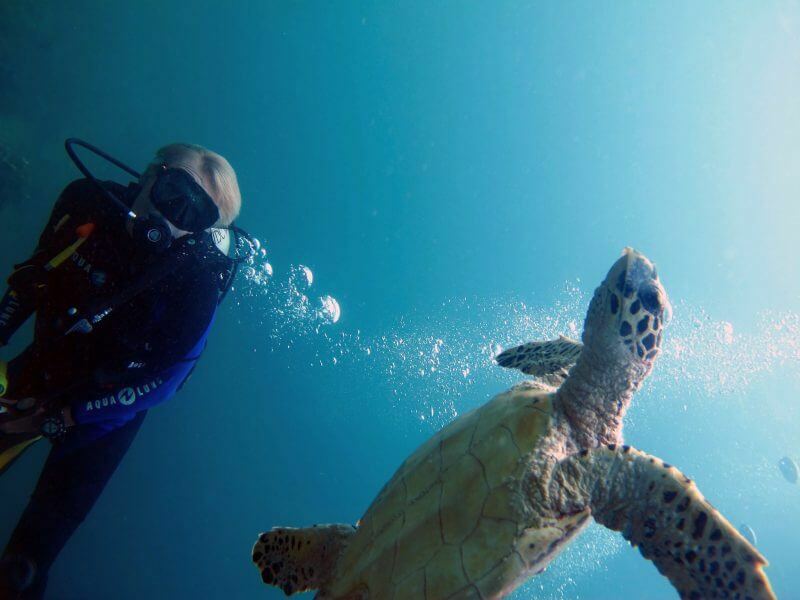 Our dive crew will expertly guide you around the best dive spots around Bacuit Bay. Your safety and satisfaction are our priorities. El Nido is a marine protected area. Marvel at the diversity of Palawan’s marine life, with over 1700 species of nudibranchs and crustaceans, 447 species of coral, 888 species of fish, and 5 species of marine turtles. See dozens of large fish species, such as butterfly fish, parrot fish, nudibranch, barracuda, moray eel, angelfish, stingray, clown-fish, snapper fish, seahorse, silver tuna, grouper fish, trumpet fish, and triggerfish. You will also find sea turtles, whale sharks, sea cows, manta rays, and some occasional dolphins and whales that may surprise you along the way. Palawan is definitely a diver’s dream, so don’t leave without exploring its amazing underwater world. PADI courses from Open Water to Dive Master are offered by our reputable PADI scuba diving center partner. With shallow reef and easy dive sites, El Nido is the best place to take the PADI Open Water Course. Our dive instructors are all PADI professionals, they will ensure your safety throughout the dive course. Talk to our itinerary specialist for a more personalized diving experience! 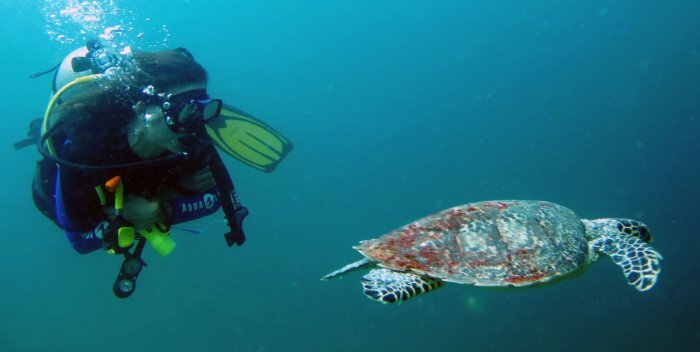 Scuba Diving in El Nido is one of the best experiences you can have in the region. Our itinerary specialist would be happy to craft the right scuba diving package for you, whether you are an experienced diver or a beginner. We are only partnered with a reputable 100% locally-owned dive center that will focus on your needs and give you an unforgettable diving experience! Entrance fees and government permits. We do the hard work of planning, organizing, and selecting the best dive center to take you on a full day scuba diving adventure, from 2 to 3 tank dives at different dive spots. 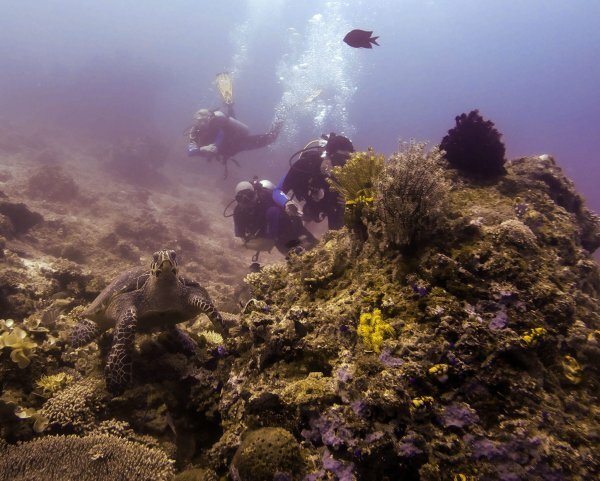 You can come to El Nido or Coron all year round, but there are seasons that are more preferred by divers. The dry season is from November to May and the wet season is from June to October. The warmest water (around 28-30 °C) is usually from March to October. Greater visibility (up to 30+ meters) is also between the months of March and October. It rains a lot during August and the boat trips get canceled due to weather and sea conditions. The best time to possibly encounter big fishes would be between November and February. Please read our Terms & Conditions prior to adding this day tour to your Palawan itinerary. Please note that the Coast Guard might cancel boat trips for safety reasons due to sea conditions or bad weather. In this case, either a refund will be made or an alternative tour or activity will be suggested. Make sure to bring your own towels, change of clothes, and swimming attire. Maintain a 3-meter distance from the reef. Please help preserve the beauty of El Nido’s marine life by not touching or stepping on the corals while diving. Palawan Alternative promotes environmental awareness in the community, and you can do your part by not contributing to the waste that harms marine life. Help us preserve the natural wonders of El Nido for the future generation by refraining from littering, using reusable bottles or containers, and segregating wastes (biodegradable and non-biodegradable).